On this page, you will find information, statistics, and resources about the death penalty at the county level. Why are counties the key to ending the death penalty? Geography plays a significant role in the application of the death penalty. Seeking the death penalty is at the discretion of the prosecutor. There are more than 200 elected County and District Attorneys in the State of Texas. 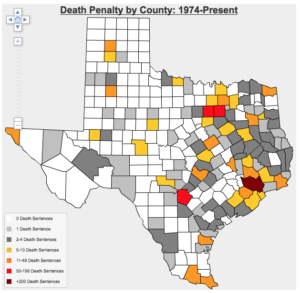 Of the 254 counties in Texas, 134 counties have never imposed a death sentence. The current death row population of Texas comes from just 51 counties. More than one-third of Texas’ current death row population – 77 individuals – were convicted in Harris County alone. Since 2014, 21 counties have imposed a death sentence. 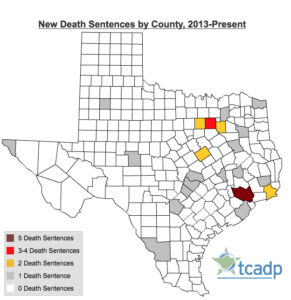 Only four counties in Texas have imposed more than one death sentence in the last five years. See TCADP’s report, Texas Death Penalty Developments in 2018: The Year in Review, for details. Pay attention to important local elections that impact use of the death penalty in your county; these include candidates for district attorney, county judge and county commissioners, and state district judges. Participate in town hall meetings, candidate debates, open houses, and other forums to engage with candidates and elected officials; ask the candidates about their approach to criminal justice issues. Attend meetings of local political/civic groups. Attend precinct and district conventions (in the spring) and state political conventions (in the summer); contact us about providing information on the death penalty at these events. In an individual capacity, work on a local campaign. This is a great way to build relationships with elected officials and other political activists in your community. Note TCADP is a 501(c)(3) organization, which means that we do not get involved in political campaigns or endorse candidates. We also are strictly non-partisan. Schedule a meeting with your current state senator and state representative in their district offices; contact TCADP if you would like to learn more about your lawmakers and their position on death penalty issues. We also can connect you with other TCADP members in your district if you would like to organize a small delegation to join you for a meeting.